Advantages: Good coverage of all Yak piston-engined fighters; excellent concentration of photos (mostly factory and official photos); clear descriptions and diagrams of variants; plenty of colour profiles for modelling inspiration. Today's modeller can build almost any variant of the Yakovlev fighter family in 1/48 scale using kits available from Accurate Miniatures, ICM and Eduard. All of these kits are well detailed and offer plenty of potential for interesting colours and markings. There is little doubt about the historical significance of the Yakovlev fighter lineage either. More than 35,000 Yak fighters were delivered during its production run at six Soviet factories, and a Yak fighter (in the hands of a skilled and motivated pilot) proved to be a worthy adversary to their Luftwaffe contemporaries. Nevertheless, reference books on Yak fighters have been scarce. Indeed, reference books about any in-line powered Soviet WWII fighters are relatively rare. There is a good book published by Polygon dedicated to the Yak-1, 1b and I-26 (the Yak-1 preproduction variant), but the text is entirely in Russian. AJ Press's "Yak-1 and Yak-3" is a handy but slim title in English; while Midland Publishing's "Soviet Combat Aircraft of the Second World War Volume 1: Single Engined Fighters" by Yefim Gordon and Dmitry Khazanov was a welcome introduction to the broad subject. It is therefore very pleasing that Gordon and Khazanov have combined again to explore the subject of Yak fighters in more detail in the Red Star Series Volume 5, "Yakovlev's Piston-Engined Fighters". 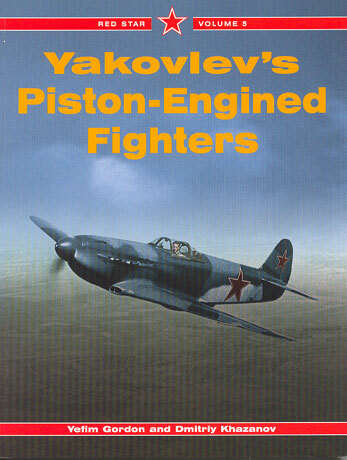 This book covers all production variants of Yak piston-engine fighters from the I-26, to the Yak-1 and 1b, the many variations of the Yak-7 and Yak-9, and to the final, excellent Yak-3. The narrative includes historical background, technical description and a brief operational summary for each variant. The text is logically organised and does an excellent job of describing sub-variants including Yak-7R, 7M, 7B, 7V, 7D and DI (these latter two actually being prototypes for the Yak-9); Yak-9T, Yak-9D, Yak-9M, Yak 9P and 9TK, Yak-9K, Yak-9B, Yak-9DD, Yak-9PD, Yak-9R, Yak-9S, Yak-9V conversion, Yak-9U and more. Photographs of each variant are included. More than 300 black and white photos are included. These are mostly factory and official photos, and they have obviously been chosen for their ability to illustrate individual characteristics of the variants. The book is rounded out with two wartime colour photographs and 30 colour profiles that will provide some additional inspiration for modellers. Gordon and Khazanov's "Yakovlev's Piston-Engined Fighters" provides a wealth of information about this great fighter dynasty. It presents the best description of the labyrinth of Yak-7 and Yak-9 sub-types that I have seen, and is packed with many useful photographs and colour profiles. This is a excellent, one-stop reference for any modeller building a WWII Yak fighter in any scale, and for VVS history buffs in general.